As the movement of the person walking is recorded by high speed video cameras a reconstructive digital model is created in order to calculate joint motion in each plane. Kinetics are the forces which act across the joints. The ground reaction force of each foot strike is measured as the person walks through the force plate. The magnitude of the ground reaction forces can then be calculated during different phases of the gait cycle. SEMG provides information about how the muscles work during walking. We can use the SEMG data to see how each muscle acts and how it contributes to the gait abnormality. Foot pressure is measured during walking through a specialized instrumented treadmill . This enables a visualization of foot mechanics, timing sequence of gait cycles , 3-D pressure distribution and a visualization of center of pressure ( gait line). How Is Gait Analysis Performed? The subject walks on the specialized walkway or instrumented treadmill. The markers are tracking motion by multi camera motion capture system . Force plates in the walkway/treadmill gather kinetic data as the subject walks over them . A computer workstation equipped with motion analysis software permits the gait data to be analyzed. After processing the gait analysis , report including video clips of your gait cycles is produced. PICTURE 4 (Picture of subject walking through treadmill). Gait analysis is extremely diagnostic for patients with lower extremity problems , patients who have pain during walking or running. People with knee, hip , foot and ankle pain. Athletes and runners. As well as people who have balance and instability issues during walking. Some categories of low back pain patients could also benefit from gait analysis. Whether you are an active sportsman, recovering from an injury or simply want to enjoy pain free mobility, gait analysis can provide valuable data for you recovery. All running and overuse conditions of the hip, knee and foot !!! and how it contributes to the gait abnormality. Foot pressure is measured during walking through a specialized instrumented treadmill . This enables a visualization of foot mechanics, timing sequence of gait cycles , 3-D pressure distribution and a visualization of center of pressure ( gait line) . The subject walks on the specialized walkway or instrumented treadmill. The markers are tracking motion by multi camera motion capture system . Force plates in the walkway/treadmill gather kinetic data as the subject walks over them . 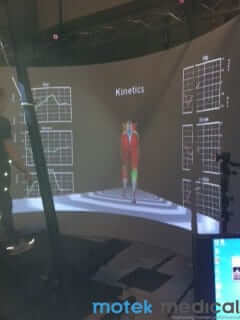 A computer workstation equipped with motion analysis software permits the gait data to be analyzed. After processing the gait analysis , report including video clips of your gait cycles is produced.